BACKGROUND: Post-traumatic acute renal failure requiring renal replacement therapy in an intensive care unit (ICU) is associated with high mortality. OBJECTIVE: To assess indicators of improved survival. 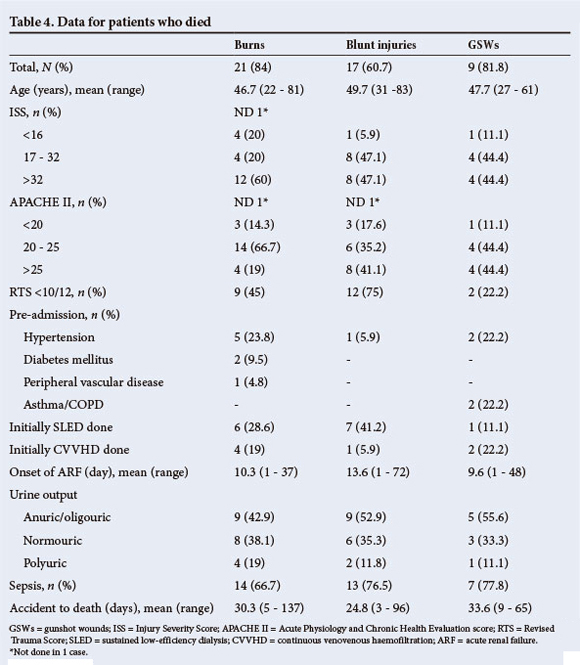 METHODS: This was a retrospective cohort study of 64 consecutive trauma patients (penetrating and blunt trauma and burns) who underwent haemodialysis (HD) over a period of 5 years. Information on pre-hospital and in-hospital resuscitation, trauma scores and physiological scores and daily ICU records were collected. 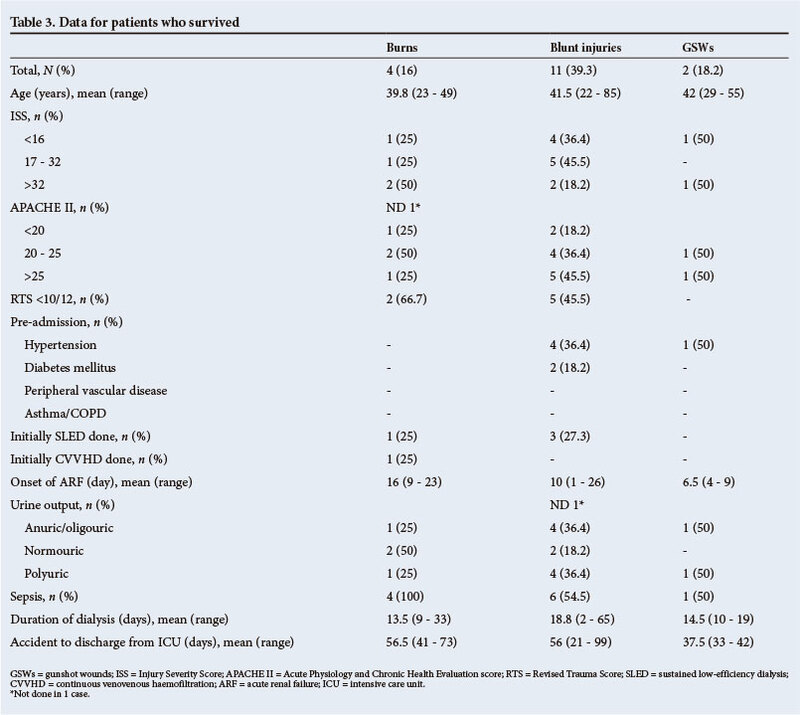 The majority of the patients were dialysed with continuous venovenous haemofiltration in the early years of the study and later with sustained low-efficiency dialysis. RESULTS: Of the 64 patients 47 died, giving an overall mortality rate of 73%. Mortality was highest in the burns patients (84%). Survival in all patients, irrespective of injury, was unrelated to the Revised Trauma Score, Injury Severity Score, Acute Physiology and Chronic Health Evaluation Score or Trauma Injury Severity Score. The duration of HD did not differ significantly between the three trauma groups, and age was not a significant predictor of survival. Patients who were polyuric at the time of the initiation of HD had a lower mortality rate than those who were oliguric, anuric or normouric, although this did not reach statistical significance (p=0.09). CONCLUSIONS: Acute renal failure in trauma patients is associated with a low survival rate. Controversial conclusions have been presented in the literature. In this study, none of the parameters previously reported to affect survival proved to be valid, although the number of patients was comparable with those in other studies. Since understanding of the predictors and course of renal failure in trauma patients is still at an early stage, there is a need for multicentre prospective studies. It has been known since the 1970s that acute renal failure (ARF) requiring renal replacement therapy (RRT) in the intensive care unit (ICU) setting results in significantly increased mortality ranging from 35% to 75%, despite advances in ICU care. Milpark Hospital, Johannesburg, is the major private sector trauma facility in South Africa, operating with the University of the Witwatersrand Trauma Unit. We reviewed survival and mortality in patients admitted to the hospital's trauma ICU and requiring haemodialysis (HD). The majority of the patients had sustained severe trauma or burns resulting in multiple organ failure and needed ventilation. They therefore had a prolonged stay in the ICU. Factors predicting outcome in these patients were assessed. The records of all patients admitted to the trauma ICU at Milpark Hospital who required HD were retrospectively reviewed. From January 2006 to May 2011 there were 73 patients, and the 64 for whom records were complete were included in the study. The study was approved by the ethical committee of Milpark Hospital as a retrospective chart review. Since patient anonymity was preserved, the committee waived the need to obtain consent from the patients whose charts were reviewed. The following information was collected for each patient: demographics, time of accident, methods of resuscitation used by paramedics at the scene, time of arrival at hospital, details of management in the hospital resuscitation area (physical examination, laboratory and radiological results, fluid administered, medication administered, procedures), Glasgow Coma Scale (GCS) score, Injury Severity Score (ISS), Trauma Injury Severity Score (TRISS), Acute Physiology and Chronic Health Evaluation Score (APACHE II) and Revised Trauma Score. We also recorded pre-existing medical conditions, the presence of trauma to head, thorax, abdomen, major vessels or limb/s, hypovolaemic/haemorrhagic shock, and requirement for and mode of ventilation. Diagnostic work-up and resuscitation were achieved according to Advanced Trauma Life Support (ATLS) principles. In the ICU, patients were managed by a multidisciplinary group comprising a trauma surgeon, an intensivist, a renal physician, and members of other specialties depending on the nature of the injury and complications. During their stay in the ICU, patients were monitored daily and detailed records were collected with regard to the onset of ARF, sepsis, systemic inflammatory response syndrome (SIRS), adult respiratory distress syndrome, septic shock and multiple organ failure. Frequent monitoring of haemodynamic and oxygen transport parameters and appropriate adjustment of tidal volume, positive end-expiratory pressure (PEEP), fluid infusion rate and inotropic therapy was carried out in order to prevent ventilator- and haemodynamically-induced disturbances in cardiac, renal and pulmonary function. Use of potentially nephrotoxic medication (non-steroidal anti-inflammatory agents, aminoglycosides, radiographic contrast agents, etc.) and all resuscitative procedures and operations, with detailed operative findings, were recorded. SIRS, sepsis, severe sepsis and septic shock were defined according to the Critical Care Medicine consensus panel. • End-stage kidney disease (class E) - end-stage kidney disease for >3 months. • Signs of uraemia, such as pericarditis, unexplained decline of mental status suggesting uraemic encephalopathy, and neuropathy. The initial method of HD depended on the clinical status of the patient. In patients with extreme haemodynamic instability requiring inotropic support, and severe metabolic acidosis with high lactate levels, continuous venovenous haemofiltration (CVVHD) was commenced. This was best tolerated haemodynamically, allowing gradual ultra-filtration and correction of acidosis, and was performed using a volumetric controlled CVVHD machine (BM 25; B Braun) with bicarbonate-base dialysate. 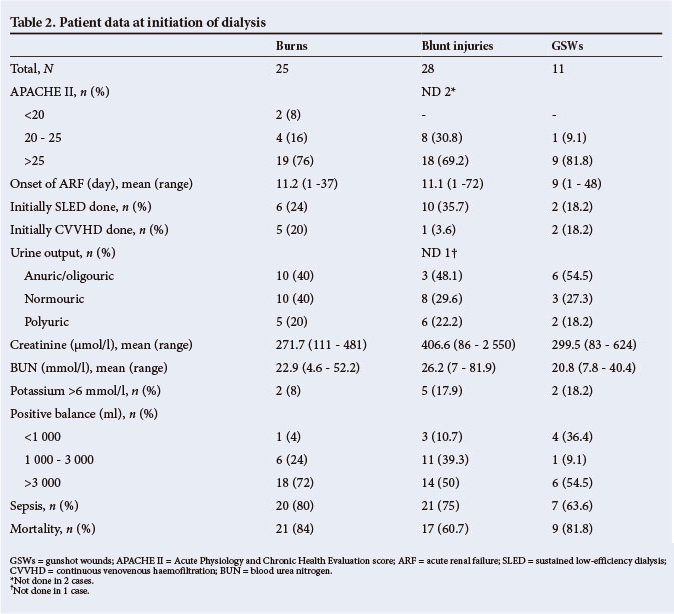 Many patients who were haemodynamically unstable and in whom anticoagulation was not desirable, because they had undergone major surgery, were dialysed with sustained low-efficiency dialysis (SLED). Saline flushes were employed instead of anticoagulation to enable dialysis to correct metabolic abnormalities without increasing the risk of bleeding. The SLED was performed for 6 - 8 hours on a Fresenius 400 B with QB (blood flow) of 100 - 150 ml/min and QD (dialysate flow) 300 ml/min bicarbonate-base buffer and cautious filtration. All HD modalities were interchangeable according to the patients' haemodynamic status and physiological requirements. All patients required a tracheostomy. A prophylactic, single-dose, single-regimen antibiotic was administered to all patients on admission, to minimise the development of infection. Patients with bone fractures and vascular trauma received a double-antibiotic regimen. Early wound excision and grafting was practised in all burns patients, in an effort to minimise septic complications. Statistical analyses were done using the chi-square test, Student's t-test, the logistic regression model, and the Mann-Whitney test, Kruskal-Wallis test and log-rank test, where appropriate. Of the 64 patients, 25 had burns, 28 blunt trauma and 11 penetrating gunshot wounds (GSWs). The demographics and physiological parameters of the patients at the time of admission, and the APACHE II and injury scores, are set out in Table 1. Table 2 shows the APACHE II scores on the day of initiation of HD, the mode of HD, the presence of sepsis and the relevant laboratory values. Table 3 shows the same data as Table 2, focusing on the survivors, while Table 4 focuses on the patients who died. 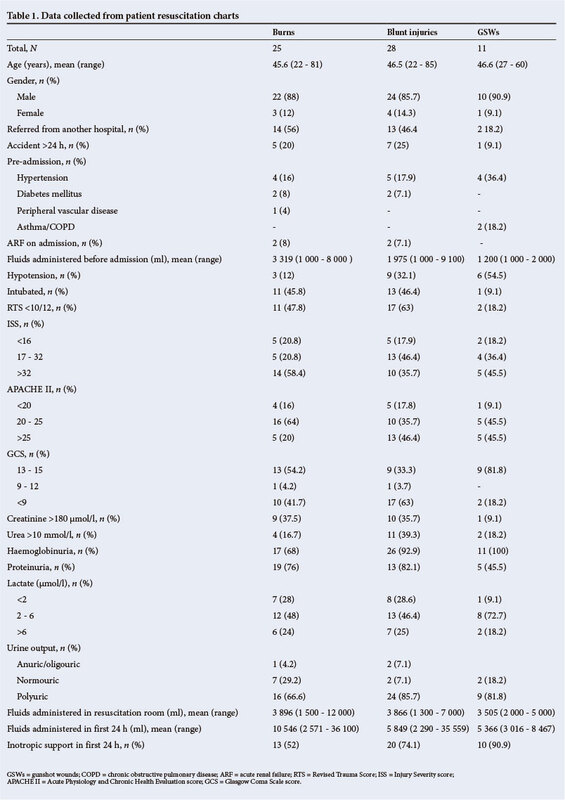 Table 5 illustrates the relationship between mortality and urine output accompanying ARF. Burns patients underwent repeat operations for tangential burn excision and skin grafting, some undergoing repeated escharotomies. The 28 patients with blunt trauma sustained 68 injuries: 4 sustained intracranial bleeding, 9 fractured ribs, 10 haemo/pneumothorax, 3 ruptured diaphragm, 4 liver laceration, 6 splenic injury, 1 pericardial tamponade, 9 fractured hip/pelvis, 1 kidney injury, 1 pancreatic injury, 4 ischaemic bowel, 1 traumatic amputation of the leg, 6 fractured femur/tibia/fibula, and 9 fractured humerus/clavicle/scapula. The 11 patients with gunshot trauma sustained 35 injuries overall: 3 sustained ruptured kidneys, 8 bowel perforations, 1 laceration of the inferior vena cava, 3 lacerations of the liver, 2 lobe disruptions of the liver, 3 laceration/rupture of the pancreas, 1 laceration of the aortic wall, 3 ruptured diaphragm, 4 haemo/pneumothorax, 2 ruptured spleen, 2 injury to the lumbar/cervical spine with para/quadriplegia, 1 lung contusion, and 2 injured arms. Of the 64 patients, 47 died, giving an overall mortality rate of 73%. Mortality was highest in the burns group, in which 21 out of 25 patients (84%) died. Of the patients with GSWs 9 out of 11 (82%) died, and in the blunt trauma group 17 of 28 (61%) died. Sepsis was the most common trigger for ARF and was present in 80% of the burns patients, 75% of those with blunt trauma and 62% of those with penetrating trauma. Pre-admission medical conditions, sometimes in combination, were as follows: 15 cases of hypertension, 4 of diabetes mellitus, 1 of chronic renal insufficiency, 2 of asthma or chronic obstructive pulmonary disease and 1 of ischaemic heart disease. One patient had a single kidney. The mechanism of injury (burns/blunt trauma/GSWs) had no significant influence on survival (p=0.126, x2-test). Age also had no significant influence on survival (p=0.114, logistic regression model). The patients who survived were a mean of 6.8 years younger than those who died, but this was not statistically significant (p=0.110, Student's t-test). Patients who were polyuric at the onset of dialysis showed a trend to better survival compared with anuric/oliguric patients, but this did not reach significance (p=0.091, x2-test). There was no significant influence of polyuria, as opposed to anuria, on survival (p=0.150, logistic regression model). Of the oliguric/anuric patients 23/29 died (79.3%), of the normouric patients 17/21 died (81%), and of the polyuric patients only 7/13 died (53.8%). Patients with an RTS of >10/12 did not have a significantly better survival rate than patients with a worse RTS (p=0.613, x2-test). There was no significant difference in survival between the different ISS groups (ISS <16, <32, >32) (0.099, x2-test). The ISS did not have a significant influence on survival (p=0.064, logistic regression model), although there was a trend towards significance (this correlation might have gained statistical significance if a larger number of patients had been evaluated). There was no significant difference in ISSs between the three groups of patients (burns/blunt trauma/GSWs) (p=0.415, x2-test). There was no significant difference in survival between the different APACHE groups (APACHE <20, 20 - 25, >25) (p=0.783, x2-test). The APACHE score had no significant influence on survival (p=0.838, logistic regression model). There was no significant difference in APACHE scores between the three different groups of patients (burns/blunt trauma/GSWs) (p=0.240, x2-test). There was no significant difference in onset of ARF between survivors and non-survivors (p=0.464, Mann-Whitney test), or between the three different groups of patients (burns/blunt trauma/ GSWs) (p=0.413, Kruskal-Wallis test; p=0.654, log-rank test). ARF in trauma patients has not been extensively evaluated in the literature. [8-13] The most recent reports relate to physical disasters, and particularly to victims of earthquakes,[14,15] a certain proportion of whom develop crush syndrome. This syndrome is rarely present in patients who suffer burns, blunt injury (falls, motor vehicle accidents, etc.) or penetrating trauma. Progress in pre-hospital care, hospital resuscitation and ICU care during the past two decades has resulted in sustained survival of patients who under other circumstances would have died on the scene or survived only a few days in hospital. The initial survival of these critically injured patients results in complications attributable to many factors, a major one being (multi-) organ failure. The few studies presenting experience with ARF in trauma patients reach differing conclusions with regard to factors that impact on prognosis. In patients in this study, hypotension was rare on presentation, and fluid resuscitation was adequate in all within the 24 hours following trauma. Thereafter all patients, irrespective of the mechanism of trauma, had tight monitoring of the fluid requirements, from simple measures to trans-oesophageal cardiac monitoring (Hemosonic Arrow). Hypovolaemia was therefore not an initiating factor for ARF. Early wound excision and grafting was practised in all burns patients in an effort to minimise septic complications. In previous studies in children with renal failure, the earlier burn excision and grafting were carried out, the better the outcome became. Such early operative intervention decreases the inflammatory response and the subsequent release of mediators, thereby improving renal blood flow and in turn reducing the severity of ARF. Survival in the patients in this study, irrespective of mechanism of injury, was not related to the RTS, ISS or APACHE II score, which was evaluated on admission, 24 hours after admission and before the institution of HD. This is in disagreement with previous publications that suggest a significant relationship between ISS and mortality and that this relationship will be stronger when a measurement such as the TRISS is used. The discrepancy with the published literature could be attributed to the number of patients in the present study. While the trend towards a positive correlation of ISS with survival might have reached greater statistical significance if more patients had been evaluated, the number of patients in this study exceeds that in most of the comparative literature. [18,20] Irrespective of the type of injury, initial trauma scores and physiological score were not related to mortality. A large proportion of patients had septic complications, despite the antimicrobial measures taken on admission. The duration of HD in survivors did not differ significantly between the three trauma groups. The survival rate was highest in the patients with blunt trauma (39.3%). Patients with GSWs had an 18.2% survival rate and patients with burns a 16% survival rate. In contrast to previous studies,[23-24] age was not a significant factor. The mortality rate in patients who were polyuric at the time of initiation of HD was not significantly lower than in those who were oliguric/ anuric/normouric. ARF in trauma patients is associated with a very low survival rate despite recent improvements in initial resuscitation and subsequent ICU care. Controversial conclusions have been presented in the few studies published. The number of patients in the present study is comparable to or larger than those of other reported series. No single parameter appeared to affect survival. This raises the question of whether assumptions currently accepted as axiomatic are incorrect. There is a need for planning of multicentre prospective studies to enable a better understanding of the predictors and natural history of ARF associated with trauma and to identify interventions that would improve survival. Author contributions; TM: concept of the study and data acquisition; PH, HP and PW: draft and manuscript writing; DD and THY: statistical analysis; PV: data interpretation, review, editing of the manuscript; KDB, ED and DD: design and study supervision.